May marked the 10th anniversary of the Convention on Cluster Munitions. Like landmines, cluster munitions were primarily banned because of their impact on civilians, and their violation of the principles of discrimination and proportionality. A total of 119 states have signed or acceded to the Convention on Cluster Munitions, and their progress in destroying stockpiles and residual bomblets can be viewed on this interactive map from the Landmine and Cluster Munitions Monitor. Cluster bombs have been used in the past few years in both Syria (by government forces), and by the Saudi-led coalition in Yemen. There were nearly one thousand cluster munitions casualties in 2016, of which 98% were civilians. 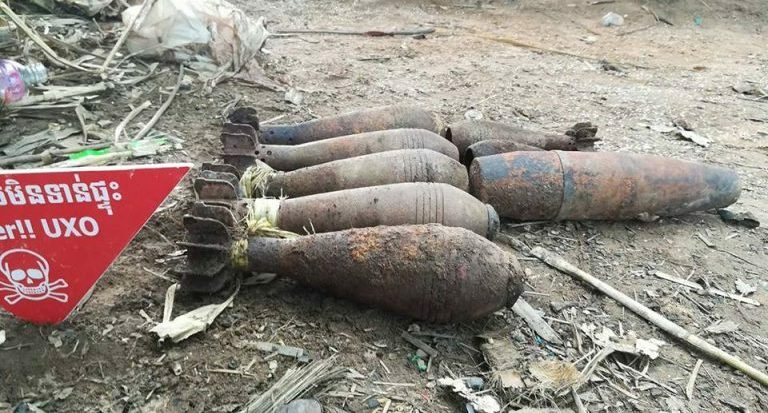 Many mine-affected countries, including Cambodia, also have significant cluster munition contamination – the two struggles are inextricable. Our sponsored Explosive Ordnance Disposal Team faces the challenges of extricating landmines and/or unexploded cluster munitions every day, and Cambodia cannot be safe until both dangers have been eradicated. The Canadian Landmine Foundation’s Paul Esau recently caught up with filmmaker Richard Fitoussi about his new project, Lloyd, which chronicles the political achievements of former Minister of Foreign Affairs, Lloyd Axworthy, in working directly with government representatives and members of civil society to engineer the 1997 Ottawa Treaty to ban anti-personnel landmines. Fitoussi has made several films about landmine-related issues, and was formerly involved with the Cambodian Landmine Museum in Siem Reap province. It’s the 30th anniversary this week of the Battle of Cuito Cunavale in Angola, the largest conventional battle in Africa since WWII. The location remains one of the most landmine-contaminated spots in the world, and a steep decline in international mine action funding to Angola has seriously jeopardized the country’s commitment to achieving mine-free status by 2025. According to recent estimates, at the current levels of funding Angola will not become mine-free until 2046. Find out more here. Mine-related casualties have risen sharply in recent years, largely as the result of a few specific conflicts. The wars in Syria, Iraq, and Afghanistan have added complexity to the ongoing effort to ban landmines by transforming the production of IEDs from a cottage industry into a significant business. Islamic State has become notorious for churning out improvised mines that contain far larger amounts of explosives than conventional mines, and require sophisticated training to disarm. The Halo Trust is going to start working to clear the 15 km long minefield around Fallujah, Iraq this summer, which is seeded with explosives from Islamic State factories. Find out more here. 4. Should Anti-Vehicle Mines be Banned? A new report from SIPRI (Stockholm International Peace Research Index) has shown that there were 169 incidents involving anti-vehicle mines in 2017, resulting in 487 casualties. Most of these incidents involved civilians. Although anti-vehicle mines are must harder to trigger unintentionally than their anti-personnel counterparts, they still pose a significant threat long after the conflict itself has passed. Is it time to consider a ban on all landmines? See the report here. Canadian Landmine Foundation Board Member and former Chairperson Chris Snyder recently published a new book on his extensive volunteer experience around the world. Creating Opportunities is a colourful and exciting collection of stories of adventures from Bombay to Phnom Penh. 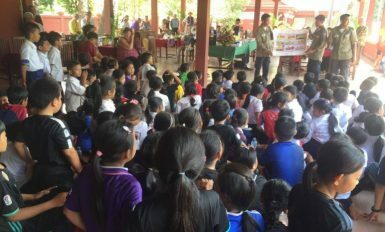 As Chris says, “Not only is volunteering for every age, but it is also for every stage of life!” Check out our website for an excerpt about Chris’ time in Cambodia! In 2008, Al Jazeera did a two-part series during the Dublin Convention’s drafting of a treaty to ban cluster munitions, which tells the contemporary story of the move to ban these deadly weapons.